The Gottman Relationship Checkup is designed as a tool for use by clinicians in a professional setting. 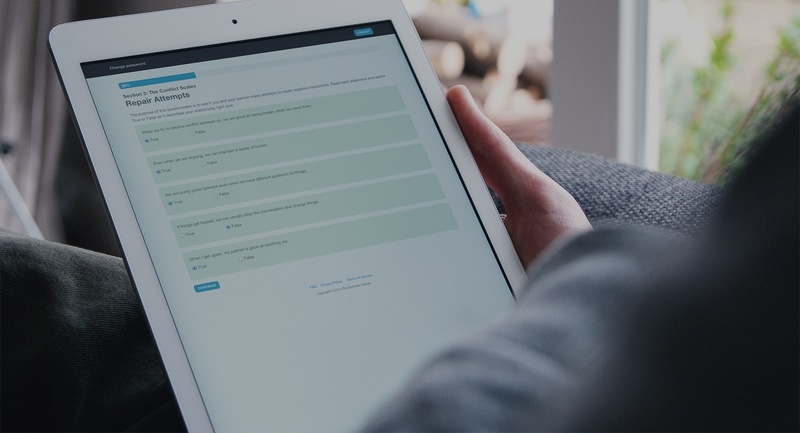 This tool streamlines the relationship assessment process for your therapist, providing personalized, clinical feedback plus specific recommendations for treatment based on your answers. Your therapist will invite you by email to The Gottman Relationship Checkup. You and your partner will each create private profiles. This information will only be available to your therapist. Your responses will be kept 100% confidential and your therapist will review the results with you. Ask your therapist to invite you to complete the Gottman Relationship Checkup. Not currently seeing a therapist? Click here to find one trained in the Gottman Method. Dr. John Gottman is a clinical psychologist who has completed more than 40 years of research on couple relationships. Dr Julie Gottman is also a clinical psychologist with extensive experience in private practice and teaching settings. Together, in collaboration with The Gottman Institute, they have created this research-based assessment tool for therapists to use with couples as a method for learning the strengths and challenges of a relationship, and to determine a treatment plan. The questionnaire is composed of 480 questions about friendship, intimacy, emotions, conflict, values, and trust, as well as parenting, housework, finances, individual areas of concern, and more. The actual time it takes to complete each assessment varies based on individual responses, the complexity of relationship dynamics, and the optional use of comment areas to provide additional information about the relationship. On average, you can expect to spend between 1-2 hours completing the questionnaire. When you have both completed your individual questionnaires, your therapist will be notified and will be able to securely log in to review your scores and the analysis of your relationship. Your therapist will be able to discuss the results with you and suggest a treatment plan for improving and strengthening your relationship.